The magic Mountain of the Moon watches the sunset form on its west side. It sees the sun, not only failing asleep, but also sinking into the ocean. It is on this side – on the beautiful and exclusive Guincho beaches and the Cabo da Roca cliffs – that Sintra kisses the Atlantic. Discover the beaches of the Sintra coast, with their fine golden sands bathed by the waves of the Atlantic Ocean. You will certainly appreciate the trip to Praia de São Julião, Praia das Maçãs and Praia Grande. No visit to the Sintra coast would be complete without a trip to Cabo da Roca, Europe’s westernmost point, “where the land ends and the sea begins” as Luis de Camões has put it in his epic poem “Os Lusíadas” . The Cabo da Roca lighthouse has been operating since 1742. The surrounding landscape is breathtakingly beautiful. With a strong maritime influence, the wets side of Sintra is full of deep leafy valleys and proud hills, namely Peninha that, from its 486 metres peak, dominates nearly everything around it. In Peninha you will find the Peninha Chapel, founded by Frei Pedro da Conceição at the end of the 17th Century. This chapel is situated at one of the most attractive points of the Sintra Mountain, by the ruins of an older one – the Chapel of São Saturnino. Vacations in Lisbon Region offers a completely variety of choices. Culture, Nature and fantastic sandy beaches. Choose an apartment in Lisbon for your vacations and discover the capital city, the sea and the mountains around. Don’t forget to check the special offers! There’s always promotions and last minute accommodations in Lisbon. Sintra is one of the most popular day trips from Lisbon. It offers a great variety of cultural building combined with a beautiful landscape. The train is the cheapest way to travel between Lisbon and Sintra with services every 15 minutes from Lisbon’s Rossio Station. You can also rent a car and take the IC19 until Sintra, or go next to the sea by Avenida Marginal, its the longest way but its worth it. Arriving to Sintra you have a lot to discover. Starting in the Historic Town Centre, stands the Royal Palace (Paço Real), one of the many monumental buildings of the region. To walk through the centre of the town is to travel through a magical world, full of extremely rich details. All this surrounded and watched over by the grandeur of the Serra de Sintra, with its luxurious, which offers endless different walks. 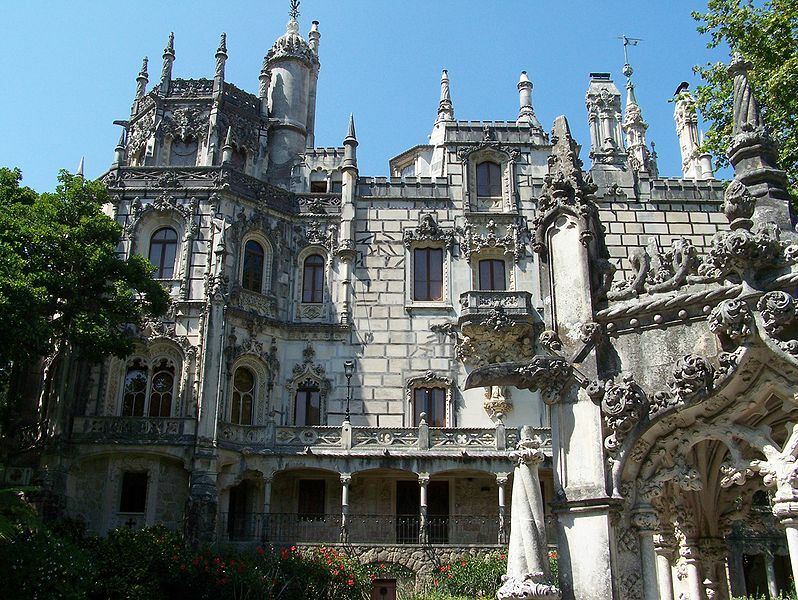 Sintra has unique examples of parks and gardens and has influenced many European landscapes. Highlights are the Pena Park (Parque da Pena) and the Monserrate Palace and its gardens (Palácio de Monserrate). High in the Serra you can find the National Palace of Pena (Palácio da Pena), the most complete and notable example of Portuguese Romantic architecture. Before you leave Sintra make sure you visit the Moors Castle (Castelo dos Mouros), and have a stop in the Café Piriquita to try de famous “travesseiros de Sintra”. You won’t regret! The proximity of the sea also makes the region a unique destination, since it has some of the most beautiful Atlantic beaches, including Praia Grande and Praia das Maçãs and the most westerly point in mainland Europe, the Cabo da Roca. So, if you intend to visit Lisbon, don’t miss a day trip to Sintra. And don’t forget – renting an apartment in Lisbon city centre allow you to combine the comfort and privacy of home life with an experience of the locals’ way of living. It is an interesting price-quality alternative to hotel rooms! We have some partners who can help you with your Sintra Tour! Additionally you can find other services like car rentals, airport transfers, and excursions or whatever else you could need to make your stay the most pleasant. Rossio train and metro station (Estação do Rossio) is located in Lisbon city centre, between Rossio and Restauradores squares. This train station is incredibly unique, formerly known as Central Station (Estação Central) and that designation still appears in its façade. 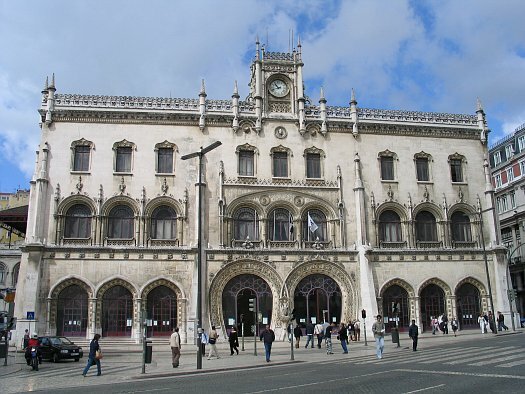 The Rossio station was designed by the architect José Luís Monteiro, between 1886 and 1887. The beautiful Neo-Manueline façade dominates the Northwest side of the square and is a Romantic recreation of the exuberant Manueline style, typical of early 16th century Portugal. The eight doors match the nine palatial windows and the incredibly decorated clock tower located on the top of the facade. Rossio station is a curiosity in that the platforms are some 30 metres above the main entrance. The platforms are connected by ramps to the façade level and is covered by a cast-iron structure executed by a Belgium firm. The station was closed to rail services from 22 October 2004 until 12 February 2008 due to tunnel renewal work. Services from Rossio Station are all suburban trains to the tourist sights of Sintra via Queluz and Rossio’s metro station (green line). Right on the leftside of the Rossio Station, close to the Restauradores square, you find Largo Duque do Cadaval. It is a bit hidden behind the recently-renovated Rossio station, and full of sunny open-air cafes. This beautiful station is a must see if you visit Lisbon, and if you want to visit Sintra, the famous town just outside Lisbon. Sintra is an inexhaustible attraction. The perfect symbiosis between nature and its built heritage led to its classification by UNESCO as World Heritage, at the category of Cultural Landscape, in 1995. Sintra has been adored over the years by artists and writers from all over the world and the passion for the town reached its peak in the 19th century, in the heart of the romantic era. See our suggestions for an accommodation in Lisbon city centre, near the Rossio Station, a step away from Sintra.